Doubling down on fake news. Update to this story. The Weather Channel defended Seidel saying he was “trying to maintain his footing on wet grass” while the two people seen in the background were walking on concrete, The Washington Post reported. 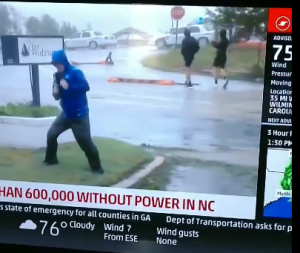 “It’s important to note that the two individuals in the background are walking on concrete, and Mike Seidel is trying to maintain his footing on wet grass, after reporting on-air until 1:00 a.m. ET this morning and is undoubtedly exhausted,” the channel said in a statement.